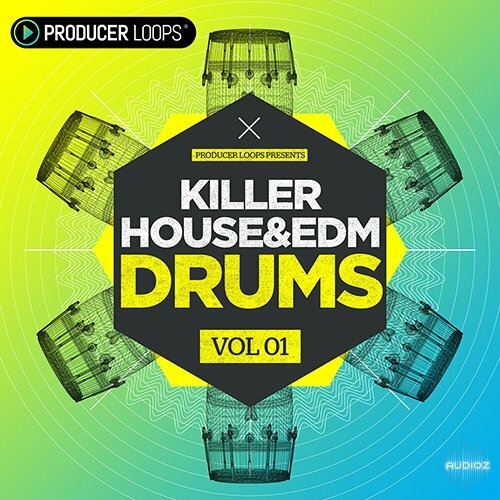 Killer House & EDM Drums Vol 1 from Producer Loops is a powerful collection of expertly-mixed drum loops and one-shots, bringing you 25 drum kits and 280 individual drum stems and single hits. Simply drag and drop into your next EDM smash hit and start crafting the perfect rhythm section. Each of the 25 complete drum kits is accompanied by a folder containing separate stems (kicks, claps, snares, hats, top loops and more) as well as one-shots, giving you access to the individual sounds used to create the full loops. Producer Loops Killer House and EDM Drums Vol 1 MULTiFORMAT has been exclusively released on AudioZ by Fantastic who chose to ask not to post mirrors.